Order a vegan gozleme, breakfast gozleme, or gourmet gozleme from a Gozleme King restaurant near you. Get Gozleme King delivered to your door! Gozleme King is Turkish street food at its finest, and with appetizing options for both vegetarians and carnivores, this spot really is a surefire crowd pleaser. 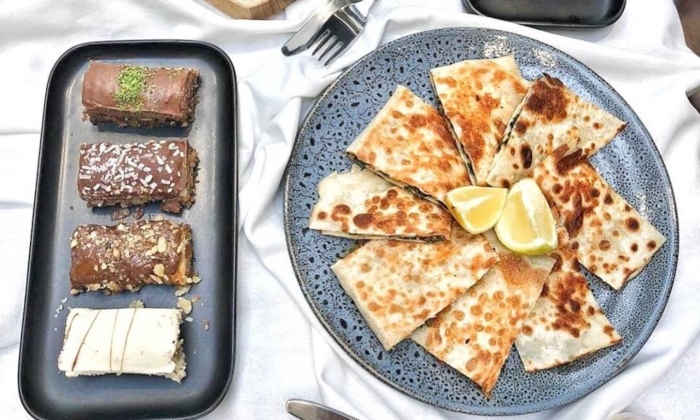 Starting out in 2003 as a scrappy pop-up store in Sydney's Frenchs Forest, Gozleme King has since grown its presence to the wider Sydney area, with its flagship restaurant opening in Liverpool in 2015. Whether you're a devout regular, or just discovering this moreish Turkish street food restaurant, you'll never regret ordering from our friends at Gozleme King. And boy, is their menu versatile! Gozleme brekkie? Why not try a feta, mushroom and egg gozleme? Or how about their Big Breakfast gozleme (feta, mushroom, egg gozleme, fresh avocado, tomatoes, cucumbers and Kalamata olives, oh my!)? Or for something a little more traditional, wrap your hands around a gourmet lamb gozleme (feta, English spinach, marinated lamb and a side of mint yogurt), or a peri peri chicken gozleme (feta cheese, English spinach, and peri peri marinated chicken). Whatever you're down for, get scrumptious authentic Turkish fare from Gozleme King delivered to your door in minutes with Menulog.